Euronews (June 27, 2013) — Oum El Ghaït Benessahraoui is a true Moroccan diva. With her trademark seductive voice, she performed at the Gnaoua World Music Festival, on the stage for upcoming talents. Born in Casablanca, she grew up in Marrakech. After studying architecture, she decided to make music her profession. In the past she has explored many genres from soul to hip hop via jazz and disco but recently she has focused on her cultural heritage and has just released a new album called Soul of Morocco. 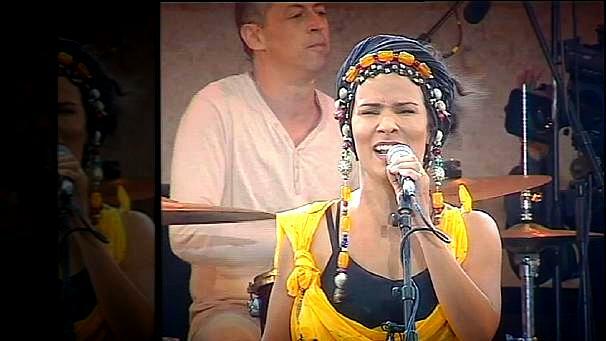 She has written and composed all the tracks on her new album and even her band is international, with musicians hailing from Morocco, France and Cuba. Oum was joined by Algerian born, France based drummer Karim Ziad. His album is a collaboration with many internationally known artists, including American keyboard player Scott Kinsey who has worked on several major film soundtracks including Ocean’s Eleven and Twelve. On en veux encore !!! quoi qu il en soit je vous met dans mes preferences merci beaucoup.